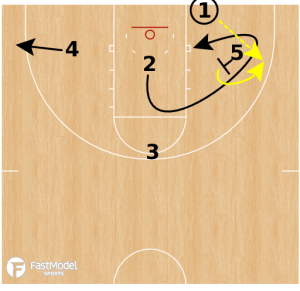 This baseline inbound play run by Purdue in the opening round of the 2018 NCAA tournament was posted to the FastModel Sports Basketball Plays and Drills Library by Tony Miller. Tony is the men’s assistant basketball coach at Bob Jones University in Greenville, SC. 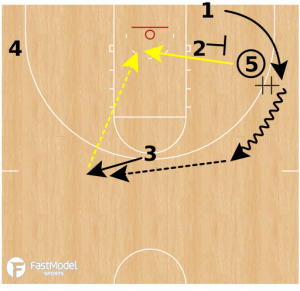 The play uses both misdirection and guard-to-big screens for an open look inside with this 3 Low OOB from the Purdue Boilermakers. 5 screens for 2 who looks back around to strong side block. 4 spaces to weak side corner. 5 hands off to 1 who dribbles toward wing. 1 passes to 3, while 2 sets cross screen for 5.